Proudly display that you survived breast cancer with a Personalized I'm A Survivor Breast Cancer Awareness Shirt. These wonderful personalized Breast Cancer Survivor Shirts are perfect for any Breast Cancer Walks you attend or simply to wear around town. 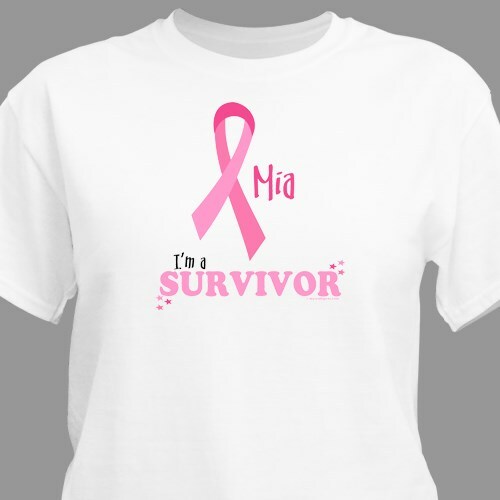 Our I'm A Survivor - Breast Cancer Awareness Personalized T-shirt is available on our premium white 100% cotton T-Shirt, machine washable in adult sizes S-3XL. Also available on Pink. Includes FREE Personalization! Personalized with any name." Additional Info MyWalkGear.com has a wonderful selection of Personalized Breast Cancer Gifts for family and friends. Whether you are preparing for a Breast Cancer Awareness Walk or a Breast Cancer Awareness Charity Event show off your desire to eliminate this disease with a Personalized Breast Cancer Awareness Shirt from MyWalkGear.com.